Hello Kitty is seen in this image provided by the BC SPCA. A missing Vancouver Island cat has been reunited with its family after nearly two years in a remarkable story the BC SPCA says highlights the importance of microchipping. 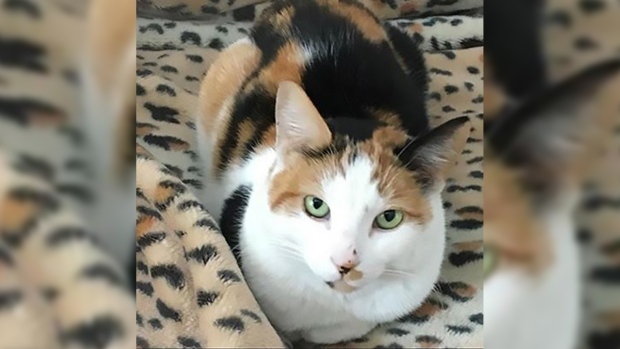 Owner Jennifer Rollins told the shelter her calico cat named Hello Kitty – or just Hello for short – escaped from her home in July 2017 after one of her kids left a door open. Rollins put up posters, but as time passed, she began to lose hope that her family would ever get the 10-year-old cat back. By that point, Hello – whose name was chosen by Rollins's young daughter – had bonded with the family dog, Athena. “They sleep together and are best friends. Hello will run around Athena’s legs and it’s super adorable,” Rollins told the SPCA. The family eventually adopted two other cats, Popcorn and Rue, from a local rescue. "Little did they know that Hello was alive and being fed by several households in the area who assumed she was a friendly stray," the SPCA wrote on its website. According to the shelter, it wasn't until this month that Rollins got a call from her ex-husband in Edmonton telling her the Comox Valley and District branch had found Hello. Rollins and her two daughters rushed to the Van Isle Veterinary Hospital where they were reunited with the cat. “I was like hyperventilating and the kids are crying. They were putting together this care package for Hello to come home and rubbing my back. It was really crazy and overwhelming but they were so nice,” Rollins told the SPCA. The cat had a chest wound, but Rollins was told she would be OK after surgery. "Hello was finally able to go home with her family, after nearly two years of living outdoors in the cold and rain," the shelter wrote. "She was reunited with her best friend Athena and despite having just gone through surgery, tried to jump out of Rollins arms to cuddle with the dog." The SPCA is using the story to remind pet owners that happy endings like Hello's are far more likely when animals are microchipped. "Hello owes her life to the Good Samaritan who brought her to the SPCA when she was injured and to her family who equipped her with the proper permanent ID, a microchip, which helped Hello find her way home," the shelter said. "Make sure your pet has the best chance of being reunited with your family by ensuring they have at least two forms of ID (microchip, collar with tags, ear tattoo) and by keeping your contact information updated."